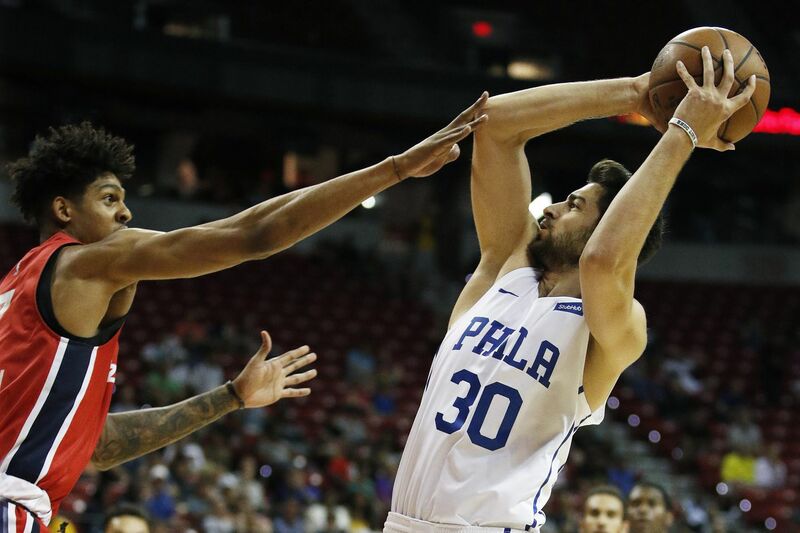 Furkan Korkmaz went 0 for 9 on his field goal attempts Monday in the Sixers' summer league loss to Washington. He has struggled since scoring 40 points against Boston. LAS VEGAS — Furkan Korkmaz wants and needs to show more consistency. In two NBA Summer League performances, the swingman looked like someone who can play a major role in the 76ers' future. In two other summer performances, the 20-year-old wasn't sharp and seemed a long way from becoming an impact player. "You are trying to take more responsibility. That's what I'm trying to do," Korkmaz said. "Sometimes I go crazy. Sometimes I'm making [shots]. Sometimes I'm missing. "But I just need to [be] more consistent. Then I will [have] more success." The Turkish player is averaging a team high 15.8 points a game in summer play. He will lead his Sixers (1-3) into a second-round playoff game against the Milwaukee Bucks (2-2) on Saturday at 8:30 p.m. at the Thomas & Mack Center. Korkmaz must have a good game if the Sixers are to advance to the quarterfinals. The second-year player scored a game-high 40 points as the Sixers opened summer play with a 95-89 loss to the Boston Celtics on July 6. It was the third-highest single-game point total in the history of the Vegas summer league. Hot from the start, Korkmaz scored 13 of his team's first 15 points. He went on to make 8 of 14 three-pointers. Things changed drastically the next night against the Los Angeles Lakers. Korkmaz missed all seven of his three-point attempts in a 96-79 drubbing. He went 1 for 9 overall from the field en route to scoring four points. That wasn't his worst performance, though. On Monday, against the Washington Wizards, Korkmaz scored just one point and failed to make a field goal in an 87-75. He missed all nine of his shots, going 0 for 5 on three-pointers. But he snapped out of his shooting slump on Thursday, sinking 3 of 6 threes and shooting 7 for 15 overall in an upset victory over the Phoenix Suns. "When you feel good and in shape, you feel like you can create more with the ball," he said. "You can go [to] the rim and you score. That's all of the players."